Vertebral augmentation or kyphoplasty using Merit’s devices is a minimally invasive procedure that combines unprecedented navigation of the vertebral body with viscous bone cement for precision treatment of symptomatic vertebral compression fractures. 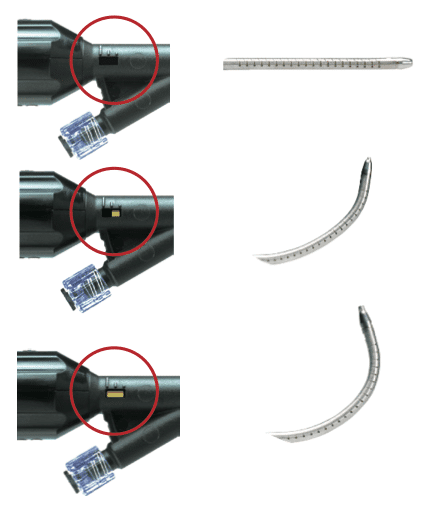 Osseoflex® SN steerable, articulating needles enable direct access to the entire vertebral body via a unipedicular approach for percutaneous vertebral augmentation or kyphoplasty. Cavity creation is achieved through the disruption of bone by steering and articulating the Osseoflex SN to create a single channel or multiple channels. After the bone is disrupted, polymeric bone cement is injected through the Osseoflex steerable needle to fill the void. The ergonomically designed handle of the Osseoflex SN gives the physician control over the direction and articulation of the delivery needle. The actuation indicator provides visual confirmation to the physician on the degree of articulation of the needle within the vertebral body. When partially articulated (30 ̊- 45 ̊), part of the yellow marker is visible in the indicator window. When fully articulated (90 ̊) the indicator window will be completely yellow.